Life, the most fatal sexually transmitted disease ever. 100% of people who live, die. Heh, reminds me of Terry Pratchett’s characterisation of Death. Life to Death: Okay I’m done with him. He’s all yours. 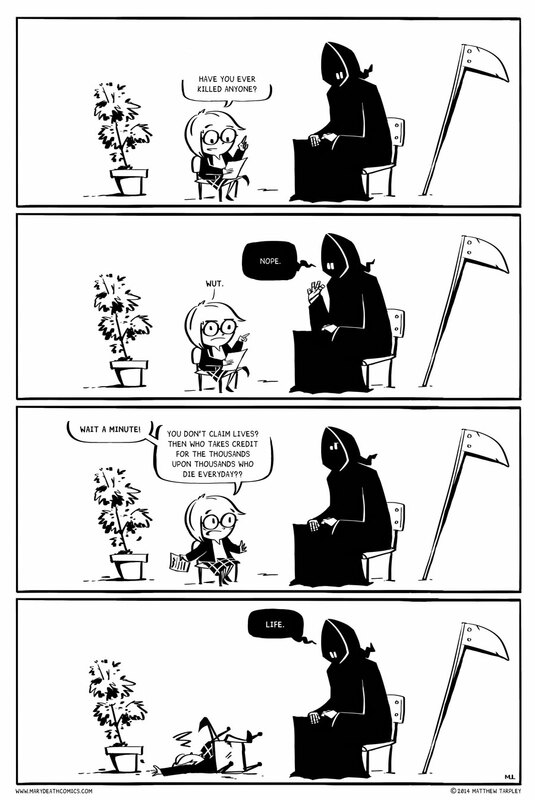 So really, Death is just a Bureaucrat with the most intense job ever! Gotta do a ton of unpaid overtime. The customers are grumpy and unsatisfied. And the boss is a huge stickler for the rules, I bet. Let’s be honest, this ‘interview’ was just an excuse to draw Mary’s reaction faces, wasn’t it? Firstly, I love the reactions. I really do. Secondly, THIS. This is the reason why Death personified wouldn’t be all that terrifying to see. He’s just the cab driver for dead people. You don’t blame the hearse driver for somebody dying, and he just happens to carry souls instead of bodies. Didn’t he kill Cthulhu? but maybe *it* wasn’t anybody?